We went to Matador meat and wine by Preston and 121 and picked up some of their extra meaty ribs. We also had some everyday Tom Thumb ribs. We were curious as to the differences that there would be. Both prepared the same way. Just a over the shelf run and a version of Tony Roma's Carolina Honey sauce my wife makes. Went on the Joe at 250 degrees bone down 2 hours, wrapped in butcher paper meat down 2 hours, unwrapped bone down with sauce about half hour. Result was two totally different tastes. The meaty ones from Matador were like eating a nice pork roast. The Tom Thumb ones were just like going to a restaurant. It sort of surprised us we thought the flavor would have been closer. You probably need an unbiased opinion so I'll take 4 of each please and I'll get back to you after my Nap. They both look pretty dang good to me. Great looking ribs. Mind if I ask the price per pound difference and if you think it was worth it? Sparetimetoys......north or south of 121 ? I keep meaning to go by Matador when I'm up by the Walmart on Ohio, or Total Wine, or getting lunch at Basera . . . but then I always forget. Red Farr wrote: Sparetimetoys......north or south of 121 ? South side on the street next to Christina's Mexican restaurant. 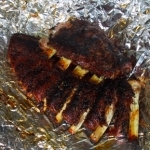 bsooner75 wrote: Great looking ribs. Mind if I ask the price per pound difference and if you think it was worth it? The one from Matador was about $30 and 4 folks could eat off of it. The store bought ones were $10 a rack. Sorry don't remember per pound price. If it was worth it I'm not sure. We had a split decision. Personally I liked the thinner ones. But the thick were good. If I want pork roast flavor I'll get a pork loin.